Oil on canvas, 24 x 20 in. Ruth Peabody is often discussed together with her mother Elanor Colburn since the two moved from Chicago to Laguna Beach together in the early 1920s; since she resided in an apartment at her mother’s home until her marriage. She studied art with her mother; and she and her mother often painted together. However Ruth was definitely her own woman. As a painter she never became interested in Dynamic Symmetry, as did her mother, but jumped from post-Impressionism to pure abstraction. She also taught and sculpted -- many of her fountains and bas reliefs grace public places. 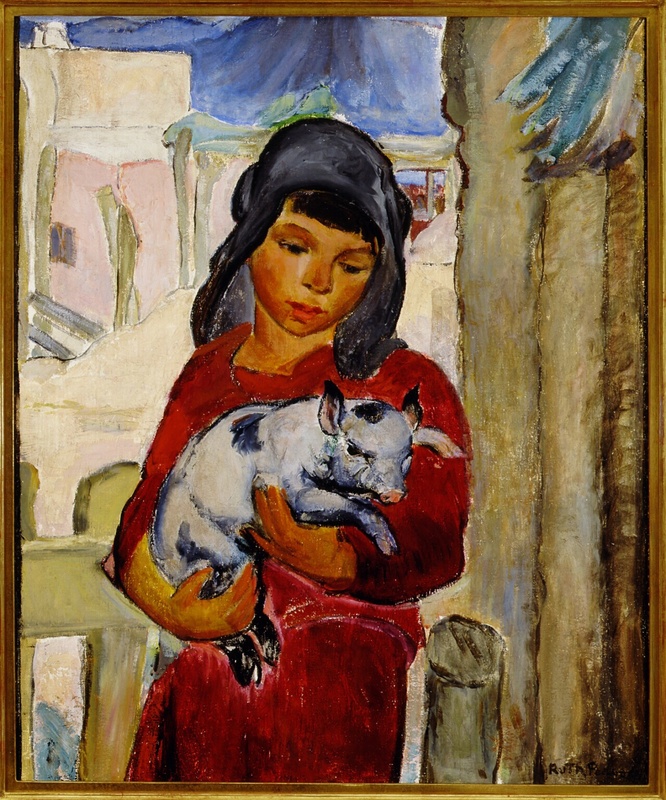 Little Pig in New Mexico is in a post-Impressionist style of lively broad brushwork and strong colors. It probably resulted from a trip to New Mexico which Peabody and her mother took in early summer 1930. Note the adobe pueblos in the background. In the 1930s, Taos, Santa Fe, and the Southwest in general became popular destinations for California artists seeking new subject matter and following new roads in their new automobiles. Peabody often depicted humans (creating both portraits and figure works) and particularly liked limning children. Ethnic types, such as this olive skinned child, were preferred subjects in the 1930s as America celebrated the common man and rural living. The pig is just one of many animals -- including a monkey, cats and dogs, pigeons, and chickens – that Peabody liked to render. Exhibitions and Publications: exhibited California Art Club, Twenty-Second Annual Exhibition, ?-December 31, 1931, no. 52; reproduced in color Nancy Moure, California Art: 450 Years of Painting & Other Media, Los Angeles: Dustin Publications, 1998, p. 402; Carnegie Art Museum, Oxnard.